As Yamaha puts it, the overall experience that makes each digital piano great is not only to be found in a great digital piano sound, but also in the strings, the touch, and the pedals. 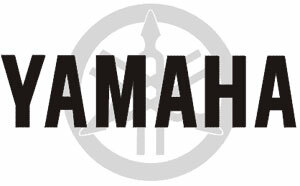 He mentions all three here, and you can check out Yamaha's product guide for further detail right here. For anyone interested in a new digital piano, there's the full map to this new beast. Here are the bullet point changes that really make this a step toward a better piano-playing experience. First, you'll be dealing with a resistant damper pedal, not just an on/off contact pedal. This allows for not only a much more realistic feel when adding and releasing dampers, but also for a high-resolution sensitivity in terms of the piano recognizing the placement of the pedal, and therefore the difference between a half damper or full damper effect that you can actually feel. On many pedals today, we have the ability to get these effects, but the difference in the Yamaha's pedals is that the resistance allows you to FEEL where the half damper point is, instead of merely judging in space, just as you would if you were dealing with real dampers. ...which they say they have, although the piano sound, polyphony, and string resonance weren't featured in the slightest in the video unfortunately, at least not with the quality of the recording. That's neither Yamaha's fault, nor is it the fault of the interviewer. NAMM is just that noisy; trust me. Still, they redid their grand piano sound with the RGP Sound Engine, and you'll be triggering it with natural wood and synthetic ivory topped keys, with a unique hammer weight for each and every single key. That means that just like a real piano, each key has a different feel from bottom to top. Yamaha went out of their way to recreate the full gradation of all 88 keys on a real piano. All this comes in anything from a rosewood to an ebony cabinet, complete with a tri-amp system and Intelligent Acoustic Control that equalizes sound at extreme low and high ends for an even response across the whole keyboard. The Clavinova series was and remains one of the most popular digital home pianos available in the United States and across the globe right now. I can't wait to try out one of these new pianos and hear exactly how it sounds away from the noise of NAMM and under my own fingers. The specs look great, so I'll be expecting great things. Check it out yourselves, and be sure to post in the forums or e-mail me and let me know exactly what you think!